Back in February in his Chinese New Year message, Prime Minister David Cameron referred to 2015 as the 'Golden Year' for relations between China and the UK. He later went on to envision a 'Golden Time' for China-UK relations in the coming five years. This coincides with China's vision, and has gradually become a consensus between Chinese and UK leaders, who have agreed to jointly initiate a 'Golden Time' for China-UK relations. In October, at the invitation of Her Majesty The Queen, President Xi Jinping will pay a state visit to the UK. This will be the first state visit by a Chinese President in ten years. The historic significance of this visit cannot be overstated. It is expected to mark a new milestone for the China-UK relationship. The 'Golden Time' is dawning but it has not come overnight. It is, rather, a result of tireless work in building political trust, economic cooperation, cultural partnership and coordination on global issues. High-level, intensive interaction and in-depth dialogues have set the tone for the China-UK relationship. Over the past decade, visits and exchanges between the UK and China's leaders have been frequent and institutionalised, including five rounds of annual prime ministers' meetings. These have provided important guidance to China-UK exchanges and cooperation in various fields. 2015 has seen China-UK relations fast-tracked. March saw The Duke of Cambridge pay a successful visit to China - the most important royal visit to China in nearly 30 years. In May, shortly after the new UK government was formed, Prime Minister Cameron was on the phone with Premier Li Keqiang and the two leaders agreed to work together to bring China-UK relations to a new and higher level. In August, a fresh round of China-UK Strategic Dialogue was held. And September will witness, in succession, the Third Meeting of the High-Level People-to-People Dialogue and the Seventh Meeting of the Economic and Financial Dialogue. Productive and win-win cooperation has laid the solid foundation for the China-UK relationship. China is the UK's fourth largest trading partner. In turn, the UK is China's second largest trading partner and number one investment destination in the EU, as well as an overseas trading centre for Renminbi (RMB), second only to Hong Kong. Trade in 2014 increased by 15.3 per cent year-on-year and totalled over US$80 billion. The first half of this year registered US$36.74 billion worth of trade in goods. Mutual investment has soared over the past three years, with inward investment from China surging by an average 85 per cent every year and tripling the total of the previous 30 years. As of 2014, Chinese direct M&A in the UK amounted to US$7.1 billion and investment stock stood at over US$40 billion. These investments covered a wide range of fields, from infrastructure and commercial property, to R&D centres and high-end manufacturing. The UK has invested almost US$20 billion in China and invested in 287 new projects in 2014. Following the launch of off-shore RMB business in London in 2011, the UK has taken a number of unprecedented steps, including signing the currency swap agreement with China, obtaining RMB RQFII quota, issuing RMB denominated treasury bonds and opening the RMB-clearing bank. Last March, the UK announced its application for membership of the Asia Infrastructure Investment Bank (AIIB) established on China's initiative. This again put the UK in the lead among all developed nations. China is ready to work with the UK and other countries to build AIIB into a new type of twenty-first century multilateral development bank, one that meets high international standards, that is professional, efficient and transparent, and will contribute to development in Asia and the rest of the world. Strong cultural exchange and people-to-people bonds have brought the people of the two countries closer, providing lasting power for the development of the China-UK relationship. 2015 is the first-ever Year of China-UK Cultural Exchange. The UK Season in China in the first half of 2015 has come to a successful conclusion. Now is the time for the China Season in the UK, entitled 'Creative China,' which will roll out a rich variety of 66 events across Britain, including visual art, design, theatre, music, dance, film, sports and exchanges between think-tanks. It will showcase China's cultural heritage and the latest developments in its innovative industry. Education is another important area of cooperation. In the UK, there are over 150,000 Chinese students, 27 Confucius Institutes and 113 Confucius Classrooms, which is more than any other European country. In China, the UK is running nine joint education institutions and 235 projects. Local governments in both countries have accelerated mutual exchange and cooperation, with 51 pairs of provinces, counties and cities having entered into a sister relationship. The number of Chinese tourists coming to the UK, 230,000 in 2014, has been growing over the past five years, and could reach 650,000 by the year 2020 according to British estimates. In addition, new Consulates were opened in Wuhan and Belfast to better facilitate people-to-people exchange. Close collaboration on global issues reflects the global and strategic nature of China-UK relations. This year the world marks the 70th anniversary of the victory of the world anti-fascist war and the founding of the United Nations. As permanent members of the UN Security Council, China and the UK have resolved to build a close partnership and jointly respond to the global challenges of the twenty-first century. China is ready to work with the UK and the international community to safeguard the victory of World War II, to uphold the purposes and principles of the UN Charter, to strive for the building of a new type of state-to-state relations based on win-win cooperation and to maintain world peace and promote development. On global and regional issues such as Ebola, Iran and South Sudan, China and the UK have maintained close cooperation. Both countries have played an important and constructive role in the search for appropriate solutions to these issues. And both will continue to carry out coordination and cooperation on the global development agenda, climate change and global terrorist threats. The two countries will work together to maintain openness in the world economy and push for the building of a fair, just, inclusive and orderly international financial system. A more mature and stable China-UK relationship will make it possible for bilateral cooperation to expand in scope and depth, and for mutual interests and win-win cooperation to grow. This will bring tangible benefits to the people of both countries and will contribute to world peace and development. As the long-expected State Visit by President Xi Jinping is approaching, we are ready to work with British colleagues to ensure the success of the visit and embrace the 'Golden Time' of China-UK relations. The Diplomat is a bimonthly magazine on foreign affairs founded in 1947. It is highly influential in Britain with a readership including mainly British royals, MPs, government officials, academicians as well as heads of mission and diplomats of high commissions and embassies in London. 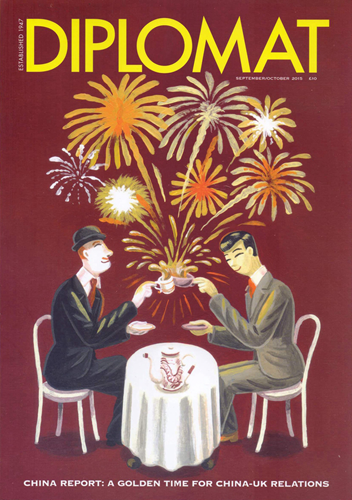 The magazine published a China Issue in the run-up to Chinese President Xi Jinping's State Visit to the UK. 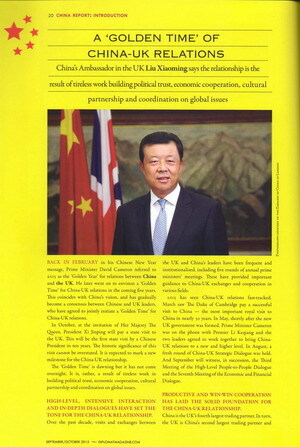 In addition to Ambassador Liu's article above, the China Issue also carried an editorial and 10 articles written by leaders in British political, diplomatic, academic, business, education, literary and art circles. These articles gave an in-depth and comprehensive introduction to exchanges and cooperation in various fields between China and Britain and may help its readers to better understand China-UK relations.